حقوق بین‌الملل محیط‌زیست فضای ماورای جو، یکی از بخش‌های حقوق بین‌الملل فضا بوده که در دهه‌های اخیر، با رشد فعالیت‌های دولت‌ها و بخش خصوصی در اکتشاف، بهره‌برداری و انتفاع از منابع موجود در فضا مورد توجه بین‌المللی قرار گرفته است. این پژوهش به دنبال پاسخ به این پرسش است که در زمینه محیط‌زیست ماورای جو، چه ارتباطی میان اصول موجود حقوق بین‌الملل فضا و حفظ محیط‌زیست فضایی وجود دارد؟ سپس چه رویکردهایی در جامعه بین‌المللی بر محیط‌زیست ماورای جو حاکم است و چه چالش‌ها و خلأهایی در این زمینه وجود دارد؟ نتیجه تحقیق حاضر بدین صورت است که علی‌رغم نبود نظام واحد بین‌المللی در زمینه حفاظت از محیط‌زیست ماورای جو، از یک‌سو با توسعه اصول موجود حقوق بین‌الملل فضا و از سوی دیگر با توسل به رویکرد امنیت پایدارمحور می‌توان در جهت حفاظت از محیط‌زیست ماورای جو کوشید. International law on outer space environment is a part of international space law that has been taken into consideration in the context of international community with the growth of governments’ and private sectors’ activities in exploration and exploitation of recourses in space. In this study, we will seek to answer the question initially that what kind of connection there is between the current international space law principles and space environment protection? Then, what approach in international community governs the space environment? And finally, what are the challenges and gaps existing in so-called area? The conclusion of this study is that one can try to preserve the environmental outer space despite the lack of an international unified system in outer space environmental protection by developing the current international space law principles, on the one hand and by using the sustainable security-centered approach on the other hand. پورهاشمی، سید‌عباس و بهاره ارغند؛ حقوق بین‌الملل محیط‌زیست، دادگستر، 1392. ضیایی بیگدلی، محمد‌رضا؛ حقوق بین‌الملل عمومی، چاپ بیست‌وششم، گنج دانش، 1385. محمودی، سید‌هادی؛ حقوق بین‌الملل فضایی، سمت، 1393. 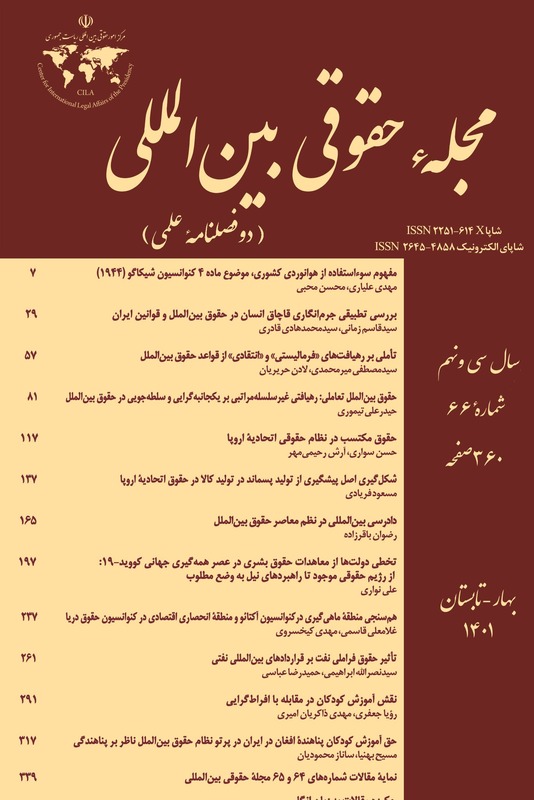 طلایی، فرهاد؛ «مجموعه معاهدات سازمان ملل متحد در زمینه فضای ماورای جو»، کوشامهر، شیراز، 1380. عبداللهی، محسن و سعیده معرفی؛ «اصل مسئولیت مشترک اما متفاوت در حقوق بین‌الملل محیط‌زیست»، فصلنامه پژوهش حقوق، سال دوازدهم، شماره 29، تابستان 1389. نواده توپچی، حسین؛ «رژیم حقوقی فضای ماورای جو زمین و چالش‌های پیش‌روی آن»، فصلنامه راهبرد، زمستان 1386 و بهار 1387، شماره 46. والاس، ربکا و مارتین ارتگا؛ حقوق بین‌الملل، ترجمه و تحقیق: سید‌قاسم زمانی و مهناز بهراملو، چاپ چهارم، شهر دانش، 1392. ترک‌زبان، اردوان؛ بررسی جایگاه اصل اقدامات احتیاطی در حقوق بین‌الملل محیط‌زیست با نگرشی بر حقوق ایران، پایان‌نامه کارشناسی ارشد حقوق بین‌الملل، دانشکده حقوق‌وعلوم‌سیاسی دانشگاه شیراز، 1381. Alam, Shawkat,Routledge Handbook of International Environmental Law, Routledge, 2013. Arend, Anthony C., Legal Rules and International Society,Oxford University Publication, 1999. Baumann, Ingo; Smith, Lesley Jane; Contracting for Space: Contract Practice in the European Space Sector, Ashgate Publishing, Ltd. 2011. Bhatt, Saligram, Environment Protection and Sustainable Development, Aph Publishing Corporation, 2004. Viikari, Lotta, The Environmental Element in Space Law: Assessing the Present and Charting the Future (Studies in Space Law), Martinus Nijhoff, 2008. Wassenbergh, H. A., Principles of Outer Space Law in Hindsight, Springer, 1991. • Brünner, Christian; Soucek, Alexander; Outer Space in Society, Politics and Law, Springer Wien New York, 2012. • Cheng, Chia-Jui, The Use of Air and Outer Space Cooperation and Competition, Springer; 1st Ed., 1998. • Cutler, A. Claire; Haufler, Virginia and Porter, Tony, Private Authority and International Affairs, SUNY Press, 1999. • Kristian, Ole, et al., Yearbook of International Environmental Law 2008, Oxford University Press, 2010. • O’Riordan, Timothy; Interpreting the Precautionary Principle, Routledge, 2013. • Viikari, Lotta, The Environmental Element in Space Law: Assessing the Present and Charting the Future (Studies in Space Law), Martinus Nijhoff, 2008. • Wassenbergh, H. A., Principles of Outer Space Law in Hindsight, Springer, 1991. Ansdell, Megan, “Active Space Debris Removal: Needs, Implications, and Recommendations for Today’s Geopolitical Environment”, Journal of Public and International Affairs, 2010. Blount, P. J., “Targeting in Outer Space: Legal Aspects of Operational Military Actions in Space”, Harvard National Security Journal Features, 2012. Bobrinsky N. and Del Monte L., “The Space Situational Awareness Program of the European Space Agency”, Kosmicheskie Issledovaniya, 2010, 2010, vol. 48, No. 5. Cameron, James; Abouchar, Juli, “The Precautionary Principle: A Fundamental Principle of Law and Policy for the Protection of the Global Environment’’, Boston College International and Comparative Law Review, vol. 14, Issue 1, 1991. Cinelli, Claudia; Pogorzelska, Katarzyna, “The Current International Legal Setting for the Protection of the Outer Space Environment: The Precautionary Principle Avant La Lettre”, Review of European Community and International Environmental Law, 22 (2) 2013. Hildret, Steven A; Arnold, Allison, “Threats to U.S. National Security Interests in Space: Orbital Debris Mitigation and Removal”, Congressional Research Service, January 8, 2014. Hobe, Stephen, “Environmental Protection in Outer Space: Where we Stand and What is Needed to Make Progress with Regard to the Problem of Space Debris”, The Indian Journal of Law and Technology, vol. 8, 2012. Imburgia, Joseph S., “Space Debris and Its Threat to National Security: A Proposal for a Binding International Agreement to Clean Up the Junk”, Vanderbilt Journal of Transnational Law, vol. 44, 2011. Kleiman, Matthew J; Lamie, Jenifer K.; Carminati, Maria-Vittoria, “Protecting the Space Environment, A Guidebook for New Space Lawyers”, vol. 9, No. 1, 2012. Lee Hudgins, Edward; Boaz, David; “Space: The Free-Market Frontier”, Cato Institute (December 20, 2002). Race, Margaret S., “Policies for Scientiﬁc Exploration and Environmental Protection: Comparison of the Antarctic and Outer Space Treaties”, In book: Science diplomacy: Science, Antarctica, and the Governance of International Spaces, by Paul Arthur Berkman; Michael A. Lang; David W.H. Walton; Oran R. Young, 2011. Rathgeber, Wolfgang; Schrogl, Kai-Uwe; Williamson, Ray A., “The Fair and Responsible Use of Space: An International Perspective”, Springer Science & Business Media, 2011. Sands, Philippe; Peel, Jacqueline; “Principles of International Environmental Law”, Cambridge University Press; 2nd Ed., 2003. Traci, Watson, “Two Satellites Collide 500 Miles Over Siberia”, USA Today, Feb. 12, 2009, at 9A. Tronchetti,Fabio, “Fundamentals of Space Law and Policy”, Springer Science & Business Media, 2013. Tennen, L. I., “Evolution of the Planetary Protection Policy: Conflict of Science and Jurisprudence?” Advance in Space Research 24, 2004. Ved P. Nanda Jr., William R. Ris, “The Public Trust Doctrine: A Viable Approach to International Environmental Protection”, Ecology Law Quarterly, 1975. Outer Space and Global Security, United Nations Publications, UNIDIR, 2003. General Assembly’s The Declaration on International Cooperation in the Exploration and Use of Outer Space for the Benefit and in the Interest of All States, Taking into Particular Accounts the Needs of Developing States (A/RES/51/122), 13 December 1996, annex, para. 5 (a,b,c). ICJ Reports 1996, 226 et seq. (214, para. 29). The Draft of International Code of Conduct for Outer Space Activities, for more information see: http://eeas.europa.eu/non-proliferation-and-disarmament/pdf/space_code_ conduct _draft_vers _16_ sept _2013_en.pdf. The Environmental Modification Convention (ENMOD), formally the Convention on the Prohibition of Military or Any Other Hostile Use of Environmental Modification Techniques. UN Space Debris Mitigation Guidelines, Sept. 2007, as annexed to UN doc. A/62/20, Report of the COPUOS o. 1, para. 1. UN General Assembly Resolution 1721 (XVI) on “International Cooperation in the Peaceful Uses of Outer Space”, adopted on 20 December 1961, para. 1(b). http://eeas.europa.eu/non-proliferation-and disarmament/pdf/space_code_con duct _draft_vers_16_sept_2013_en. pdf (last visit 2/12/2014).